Hansen Building and Design Corporation has extensive experience in the design and construction of Dental as well as Orthodontic clinics throughout Southwest Michigan. We work directly with your supplier, to make sure all your equipment is properly specified, not only for your present needs, but with preparation for future growth. By looking forward to future growth, we minimize the cost of adding additional ops by providing all the plumbing and electrical connections that allow you to grow. During the installation of your equipment, our technicians work, directly, with the installers, to insure a smooth, trouble-free installation. Our floor plans provide the spatial relationships that help make you and your staff more efficient, which allows you to see more patients, make more money, and feel more relaxed at the end of the day. We create an environment, for your patients, that helps ease the anxiety of going to the dentist. 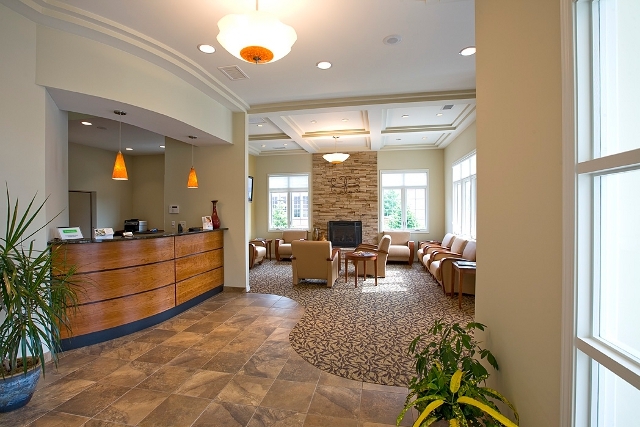 Our waiting rooms and ops are designed to do away with the typical cold, clinical feeling of most dental offices and, instead, provide an attractive, comfortable, inviting space that is full of warmth. If you need help with land acquisition, we can help identify a locale that gives you maximum exposure and room for future growth. We can negotiate the purchase for you, and coordinate all the many things necessary in land acquisition. We help you select a site that will add to the value of your building, and practice, for many years to come. Please contact us for a tour of some of our dental facilities.